BOULDER, Colo. — Cheribundi, Inc. is excited to announce that two of their top-selling Fruit Refresh blends, Pomegranate and Cranberry, are now available to purchase in the beverage coolers at Quick Chek. CEO Brian Ross says, “Quick Chek conveniently provides fresh, quality products to their customers. We are excited to partner with a leading convenience store chain and introduce Cheribundi Fruit Refresh to their loyal shoppers.” Cheribundi tart cherry juice products are available nationwide in grocery, natural and specialty retailers, including Kroger, Rite Aid, Whole Foods Markets, Sprouts, The Fresh Market, and more. Please visit www.cheribundi.com for more information. While the Cheribundi Fruit Refresh blends are popular Cheribundi choices, Cheribundi also offers many other tart cherry juice products. 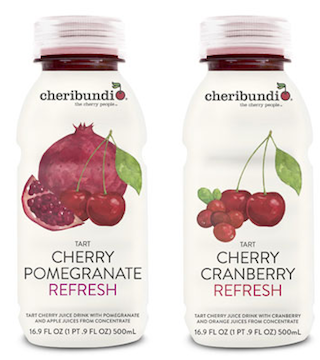 Cheribundi products include five Fruit Refresh blends, four Tea Refresh blends, two organic frozen puree smoothie packs, and five functional tart cherry juices. Cheribundi is a fresh-pressed tart cherry juice made from a proprietary juicing process developed by scientists at Cornell University to yield peak antioxidant levels. Regular consumption of tart cherry juice is reported to reduce post-exercise muscle and joint pain. Tart cherries’ anti-inflammatory benefits may reduce pain from gout and arthritis, and they have an extensive list of heart health benefits. They also contain significant levels of melatonin that is believed to promote deeper, more restful sleep. Over 90 NCAA and professional sports teams, plus hundreds of professional and amateur runners, cyclists and triathletes are currently purchasing Cheribundi for muscle recovery, better sleep and less pain.